A veterinarian with a tranquiliser gun is the only hunter in this Kenyan wildlife reserve. The quarry is a female elephant in Tsavo National Park. His shot will have to be sure; there is little time to waste with the mother’s calf next to her, waiting. 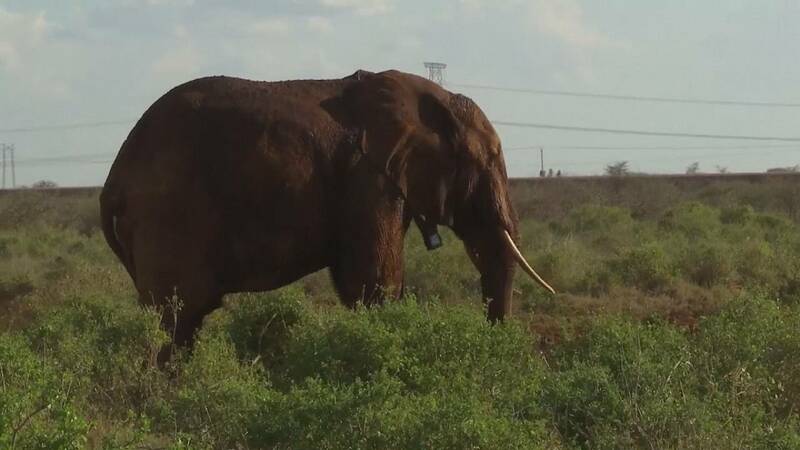 This elephant is one of 10 in the park that are being fitted with radio tracking collars – five males and five females. It is a joint project between the Kenya Wildlife Service and the ONGSave the Elephants. They want to track the elephants’ movements to find out where they cross major roads and a new railway line that is under construction nearby. The team wants to work out where to build so-called “wildlife corridors”, purpose-built tunnels that allow elephants to cross under roads and railway lines without putting themselves or motorists in danger. “The main objective for tracking these animals is to know where they cross the roads, and where they cross the standard gauge railway that is currently under construction, so then we can use that information to better plan for where future underpasses can be put where animals can cross,” says Save the Elephants Head of Monitoring Benson Okita. Kenya signed an agreement with China in 2013 to construct a new standard gauge railway from Nairobi to Mombasa, part of which will run through the Tsavo National Park. The section of the line that passes through the park is being built at a raised level to allow space for underpasses for the animals underneath. The Tsavo ecosystem is home to Kenya’s largest single elephant population, according to non-profit organisation the Tsavo Trust. It says there were just over 12,000 elephants in the Tsavo Conservation Area in the 2011 census. Robert O’Brien is Assistant Director of the Tsavo Conservation Area at the Kenya Wildlife Service. He says monitoring the elephants’ movements will help also to reduce conflict with humans, which has been a key issue in this area. The Kenya Wildlife Service veterinary team does a lot of its work from the air and flights become routine, despite the dangers of preparing the sedative used to stick their prey with in a bobbing helicopter while tree-hopping. Once a herd leader is darted the other elephants gather nearby while the big bull goes under, another unknown set of possibilities for the team. Sospeter Kiambi, a coordinator for the Kenya Wildlife Service elephant programme, says the project is potentially dangerous for both elephants and people but he also says that this exercise is necessary to gather this data to help authorities make decisions about infrastructure in relation to wildlife movement. “It is a very expensive exercise. One collar costs approximately 4000 US dollars, (or more than 3,500 euros). We are putting this much resources in to try and quantify in scientific ways how infrastructure is affecting wildlife distribution, and more so elephants, so that in the future we will have a scientific backup to help inform decision making,” says Kiambi. Save the Elephants says the Tsavo ecosystem is under threat from urbanisation, climate change and poaching, all of which are crippling the number of elephants. Projects like this one could help elephants and people live together a little more harmoniously. For the elephants the only problem is getting used to their new collars.